California’s agricultural prosperity increasingly depends on groundwater availability during drought. Global markets favoring high-value nuts, fruits and wine grapes are fueling a steady conversion of farmland from annual crops and pasture to orchards and vineyards. The growing profitability of these permanent crops, however, cannot be sustained unless agricultural communities commit to preserve and manage groundwater as a buffer against drought. Three researchers with the UC Davis Center for Watershed Sciences explain why. Without access to groundwater, this year’s drought would be truly devastating to farms and cities throughout California. Groundwater is California’s largest source of water storage for drought. However, reduced recharge and growing groundwater use in wetter years threatens to diminish its availability in droughts. This can become a serious threat to California’s agriculture and rural residents. The current drought highlights how much California’s agricultural prosperity depends on groundwater — and agriculture’s growing need for managing it. Agriculture in California is undergoing significant economic growth and intensification, beyond any growth in irrigated acreage and water use. Global markets favor the state’s nut, fruit, vine and vegetable crops with high prices. This has fed conversion of agricultural land from annual crops and pasture to tree and vine crops (Figure 1). Today about 3 million of California’s 9 million acres of irrigated farmland are in tree and vine crops, which provide more than 59 percent of the state’s gross crop farm revenues. 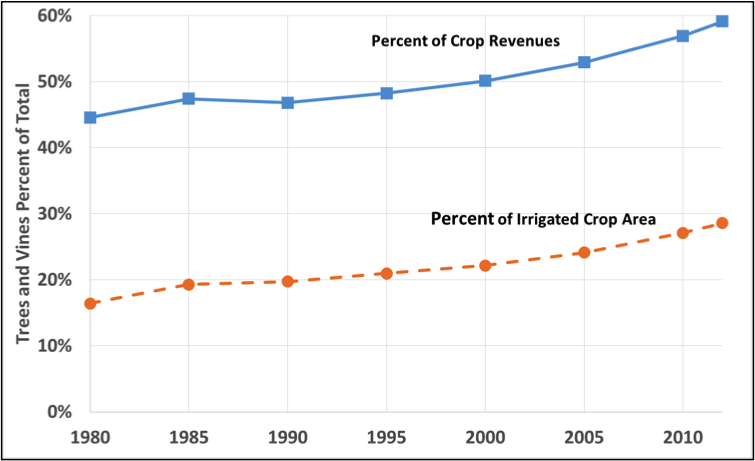 This economic intensification of permanent crops makes agriculture more profitable, but also more dependent on groundwater being available during droughts. During drought, groundwater supplies well over half of California’s water. 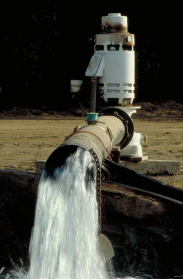 Over time, groundwater is replenished by recharge from rivers and “excess” irrigation water, by intentional recharge and, in wet years, by precipitation. In wet years, when surface water is more plentiful, California’s aquifers receive much more recharge from streams and percolation from surface-water irrigated cropland (Figure 2). In dry years, reduced streamflows and surface water deliveries can drastically reduce surface-water recharge to groundwater. Farmers instead pump more groundwater to sustain their crops, often at higher irrigation efficiency. 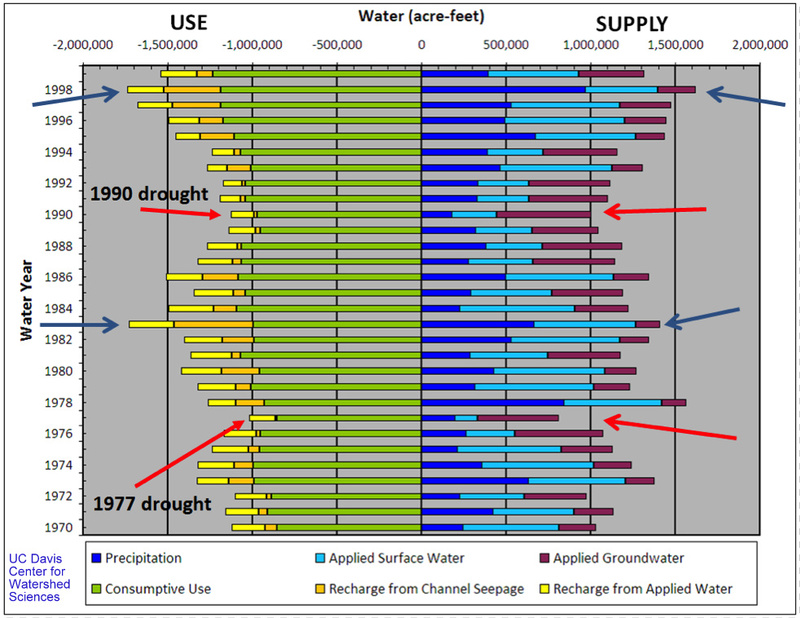 Some parts of California carefully price surface irrigation water to manage this balance, making surface water less expensive in wetter years to discourage groundwater pumping and encourage recharge from surface water (Vaux 1986, Jenkins 1992). If too much water is pumped in wetter years or irrigation becomes too efficient without intentionally recharging saved surface water supplies, groundwater becomes depleted and unavailable during droughts. California’s growing water scarcity (from growing human and environmental demands and, perhaps in the future, from climate change) is upsetting this balance. If too few years are wet, groundwater recharge is no longer enough for drought years. Without some overall management of the groundwater basin, farmers are likely to react individually to less surface water availability by pumping more groundwater. However, over time, groundwater depletion will raise pumping costs and dry up shallower wells. This leads to groundwater becoming less reliable in droughts and more costly in all years. Drought years require more fallowing, as pumping costs increase and groundwater is less available. This reduces farm and rural incomes in drought years and increases economic volatility in rural areas. Lower drought-year reliability makes it riskier to plant the more profitable permanent crops. This greatly reduces farm and rural incomes and investment in all years. Groundwater drawdown can cause land subsidence, creating potentially costly disruptions to regional flood and irrigation systems. Seawater intrusion in coastal basins makes groundwater less available for irrigation and drinking water. While the latter two issues have regained some attention in this drought year, we want to focus on the first two points to illustrate the nexus between economically successful farming and regional groundwater management. Consider a simplified example of an irrigation district whose groundwater is fed only by return irrigation flows, but has sizable surface water supplies in wet years and no surface water available in dry years (Figure 3). Farmers in this district can plant permanent crops for $1,000 an acre in yearly profits or an annual crop for $500/acre-year profit. One quarter of irrigation water use recharges groundwater. Figure 3. Irrigation district with permanent and annual crops, with wet-year net recharge to groundwater and dry-year pumping to support permanent crops. 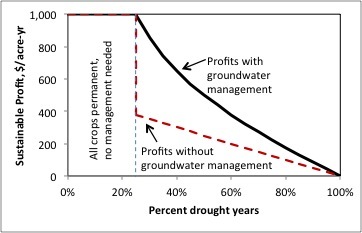 With more than three out of four wet years of imported surface water, groundwater recharge can support pumping in droughts and farmers can profit from having a large proportion of profitable permanent crops (Figure 4). All land is in permanent crops and the average profit is $1000/acre-year (Figure 5). However, as dry years become more frequent, profit-minded farmers need to find ways to preserve groundwater for dry years, particularly for permanent crops. Groundwater can be preserved for dry years by increasing recharge in wet years (by artificial recharge programs) if enough surface water is available or by reducing groundwater withdrawals in dry years by fallowing annual crops. In any case, local groundwater management promotes profitability for district farmers. 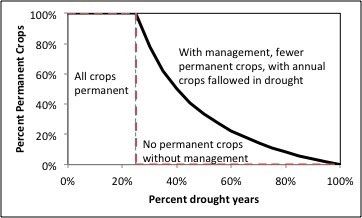 Without supplemental surface water, farmers would reduce their permanent crops with more frequent drought years (Figure 4). This would be accompanied by increasing annual crops in remaining wet years to maintain profits and recharge, but fallowing the annual crops in dry years to better sustain remaining permanent crops – requiring limits on dry year pumping. As the proportion of dry years increases, dry-year fallowing increases and the sustainable proportion of more profitable permanent crops decreases (Figure 4). But maintaining enough wet-year annual crops to fallow in dry years requires that farmers cooperate – either by restrictions or cooperative contracts. The differences in profits with and without groundwater management are shown in Figure 5. Without groundwater management, permanent crops can be sustained with enough wet years, but when droughts become frequent enough, groundwater becomes depleted and crops can be grown only in wet years – meaning permanent crops are no longer viable and less profitable annual crops are grown. If farmers plant too many acres in permanent crops, groundwater depletions lead to drought years without enough water for them, resulting in large economic losses. If farmers maintain enough annual crops to fallow in drought years, then permanent crops and overall profits can be maximized, even in drought years. However, without cooperation in fallowing during dry years, the insecurity of drought groundwater availability reduces permanent crops below their most profitable levels. Farmers now have economic incentive to cooperate in managing groundwater. The growing profitability of permanent crops gives agricultural communities a decided long-term interest in preserving and managing groundwater as a drought buffer. With more dry years and diminished surface water availability, fallowing must inevitably increase during droughts, unless groundwater overdraft or additional water imports or recharge are available. Droughts raise our groundwater consciousness, but wet years wash it away to the peril California agriculture’s long-term prosperity. Farming will be less profitable, more volatile and provide fewer economic opportunities without more organized and better informed groundwater management. ACWA (2014), Recommendations for Achieving Groundwater Sustainability, Association of California Water Agencies. ACWA (2011), Sustainability from the Ground Up – Groundwater Management in California – a Framework, Association of California Water Agencies. Faunt ed. (2009), Groundwater Availability of the Central Valley Aquifer, California: U.S. Geological Survey Professional Paper 1766, 225 pp. Harou, J.J. and J.R. Lund (2008), “Ending groundwater overdraft in hydrologic-economic systems,” Hydrogeology Journal, Volume 16, Number 6, September, pp. 1039–1055. Harter, T., et al. (2012), Addressing Nitrate in California’s Drinking Water with a Focus on Tulare Lake Basin and Salinas Valley Groundwater. Report for the State Water Resources Control Board Report to the Legislature. Center for Watershed Sciences, University of California, Davis. 78 p.
This entry was posted in Uncategorized and tagged agriculture, drought, groundwater management, Jay Lund, Josué Medellín-Azuara, Thomas Harter. Bookmark the permalink. When California agriculture depletes or contaminates groundwater, how many millions of individuals dependent upon groundwater, do they negatively impact? The negative impacts from excessive agriculture are significant and cannot be mitigated without significant changes in California’s agriculture. The article makes a good case with numbers demonstrating that current water use and agricultural plantings are incompatible and unsustainable. Unfortunately the UC system through its agricultural representatives does not adequately encourage safe or sustainable agriculture. Instead, maximum production and financial profit with little regard to environment and the general population is encouraged. The transition from annual and winter cropping to permanent crops that require greater volumes of water that will in turn lose more water to the atmosphere further exacerbate our water supplies. If the overdrafting of groundwater was made illegal that would be a huge step towards correcting this problem. What is the storage capacity of California aquifers? How full are they on average? If we actively pumped water into the aquifers, how much more water would/could we store? What new infrastructure do we need to do the pumping? At what cost? Shouldn’t we meter all agriculture consumption? Is this infrastructure more important to solving long term water issues than the proposed tunnels around the delta? It makes sense that farmers in California would want to have their groundwater treated. It would be bad if they were pumping in inadequate water! The quality of the water is pretty important, especially when it comes to plants!